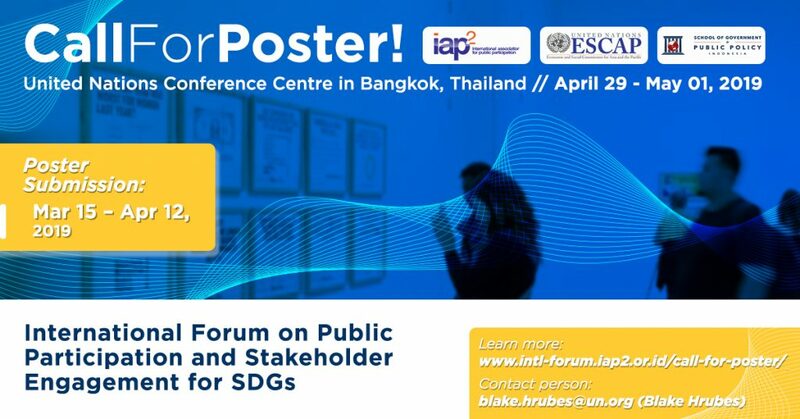 The International Forum on Public Participation and Stakeholder Engagement for SDGs organized in partnership between IAP2, UNESCAP and SGPP Indonesia is now inviting posters for the event. The posters present an opportunity to publish in a concise and visible format of current results, research contributions, works-in-progress, interesting projects and case studies, sponsorships and other relevant initiatives that are related to the forum themes (See the themes at intl-forum.iap2.or.id). Accepted posters will be exhibited in the event venue, including a designated poster session, facilitating presenters with opportunity for to engage in discussion with other attendees. Posters are an informative, creative and popular alternative to the oral presentation of a paper. Using the posters, the forum provides a range of opportunities for people concerned in the issues of Public Participation (P2), Stakeholder Engagement (SE) and Sustainable Development Goals (SDGs) to reach a global audience. There is no formal oral presentation needed in a poster session. Each author will be assigned with a display area to present diagrams, graphics, data, pictures/photos, and a limited text. The poster should be interesting, effectively communicating message and self-explanatory. The author, however, should be available during the dedicated poster session, refreshment breaks and other certain times to interact and answer questions from the audience. Authors are encouraged to submit a draft poster attached with not more than 1 page of information paper, which briefly describes their research, works-in-progress, project/case study, sponsorship or other initiative addressed, including their contribution to the community. A topic statement or title that clearly explaining the initiative. A brief description of the poster. A brief explanation of intention and goal. Description of background: what the problem is, why it is important, and what the knowledge building on. Description of process or method: the design, the sample, the instruments, and how the data are collected and analyzed. Results and outcomes: Describing the findings. The Draft Posters and its Paper must be submitted online (website: intl-forum.iap2.or.id). English is used for all submissions, and it is the primary language used at the forum. Participants with an accepted poster paper must register for the conference and present their poster during the session. A space will be allocated to each participant to display the poster. Posters prepared for the poster session that do not meet minimum quality standards may be eliminated from display by the program committee. All presenting authors are required to submit a registration form, with full fees paid, by April 24, 2019. During this international forum event, a dedicated poster session is set up to allow more time for the poster authors/presenters and the audience to discuss the subject matter, facilitate more personal interaction, exchange contact information, and exchange of professional experience. 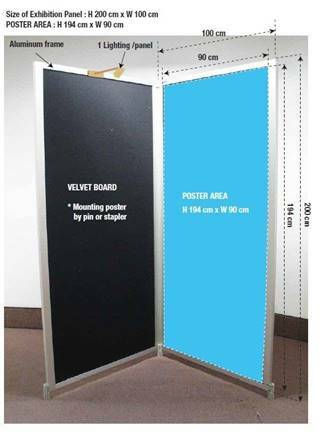 A poster presenter will be assigned one space on a flat, upright panel. Presenters are required to submit an abstract for the poster, to use the panels provided by the event, and to provide the materials to hold their posters in place. If the presenters need more than one poster space, they should contact the IntlForum secretariat for price information (secretariat: intl-forum@iap2.or.id). The shapes and dimensions of the boards and the materials from which the poster boards are constructed will be officially provided in the abstract acceptance notice and/or follow-up information sent by the program committee. Initial sample of the exhibition panel, however, can be seen in the Picture 1. The Program Committee will recognize several excellent poster presentations by selecting a Public Choice Best Poster during the event. The best selected posters will be acknowledged throughout the event with a ribbon on the poster designating its “Best” status, and authors are awarded certificates and highlighted in the event’s media information (newsletter, website, etc). Picture 1. Sample of Exhibition Panel.